Glass sculptures bring trees to life | Where to next? If you’re in Canberra over the next two weeks, be sure to drop in to see the current exhibition at the Canberra Glassworks. The Tree, curated by Clare Belfrage, features 25 established and emerging Australian glass artists. Each artist was asked to create a piece that reflects our relationship with trees—from their beauty to their place in mythology to the ways they are exploited. The exhibition continues through 8 May, and the Glassworks is open Wednesdays through Sundays from 10am to 4pm. Admission is by a gold coin donation. I’m sharing pics of a few of my favourite pieces, but go see the artworks for yourself. The Glassworks also offers classes, demonstrations and workshops. And plenty more exhibitions are coming up. The breathe one is particularly imaginative and well-executed! I love it too, which is why I put it up top. 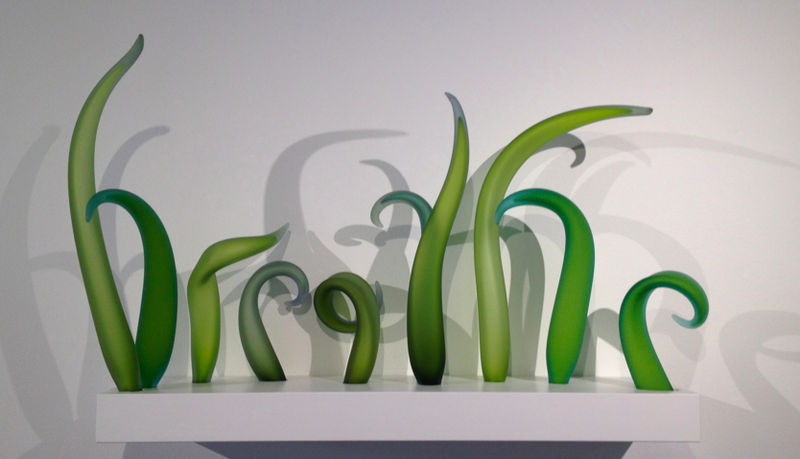 I love glass AND Chihuly too. Most recently I’ve seen his work in Seattle and Dallas. Even managed to write about and photograph the Dallas event. Hi, glad you stopped by. Your great sense of humour really shines on your blog.